Ugh. Just thinking about Christmas of 2002 makes me want to throw up! I was pregnant with Benjamin and still in the worst part of morning sickness. With both pregnancies I threw up all the way through giving birth. No fun. My birthday is Christmas Eve, and I told everyone that the only thing I wanted for my birthday was to NOT throw up. I got my wish, and at a few minutes past midnight when my birthday was over and Christmas had arrived, I had to race to the bathroom to "celebrate". Ugh. Sorry to say, we did not do a Christmas card in 2002! If we had, it would have been me in a lovely shade of green. 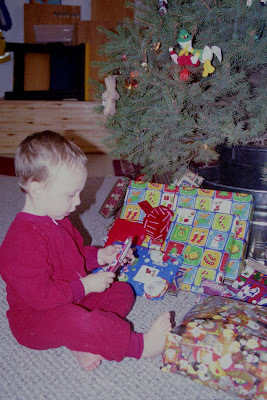 But I will show you a sweet photo of Nathan opening a gift at my Mom and Dad's house. He was so precious that year! He would open one present and want to play with it rather than moving on to open the next gift... my how things have changed!